Age of Empires: Chinese Art of the Qin and Han Dynasties (221 B.C.–A.D. 220) on view at the Metropolitan Museum of Art (April 3–July 16, 2017) shows how art was pivotal in the formation of a Chinese identity. Too small to fully appreciate without holding, coins often go unnoticed in major exhibitions. They remain reminders of monetized economies, the flow of goods, and regnal shifts. In addition to commissioning China’s Great Wall, the Qin ruler, Ying Zheng (r. 247–220 BC), unified the empire’s monetary system increasing the circulation of copper coinage. He also introduced standards of universal weights and measures. Such policies made money a cosmopolitan language of exchange across vast territories. Water clock excavated from burial pit no.4 of Tomb no. 8 at the burial site of the Zhang Family, Fengxiyuan, Xi’an, Shaanxi, 2009. Image: Metropolitan Museum of Art. An impulse to standardize Chinese knowledge is a phenomenon apparent through several non-monetary objects showcased in the exhibition. 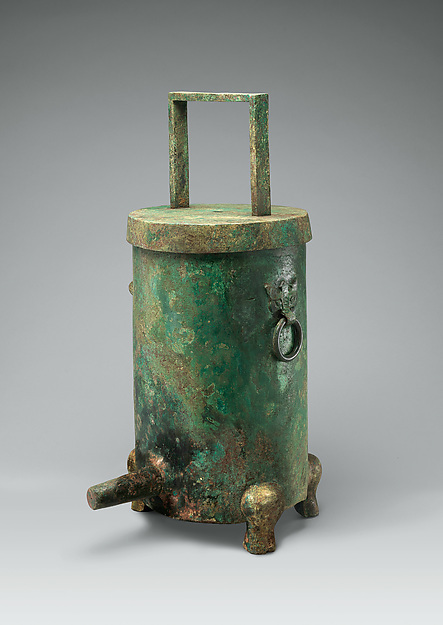 A bronze waterclock from the Western Han dynasty (206 B.C.–A.D. 9) embodies this characteristic. A piece of wood or bamboo was likely fed through a small hole in the lid of this container. As water drained out of a tube at its bottom at a steady rate, the wood would sink and mark time. It was the norm for these clocks to be kept in all Qin and Han administrative offices. This simple technological solution brings to mind a number of waterclocks throughout art history. On the opposite side in the spectrum of simplicity, the design for a waterclock of al-Jazari in twelfth-century northeastern Syria/Iraq, a manuscript of which is in the Met’s Islamic holdings, would be a much more fanciful and multipurpose innovation. 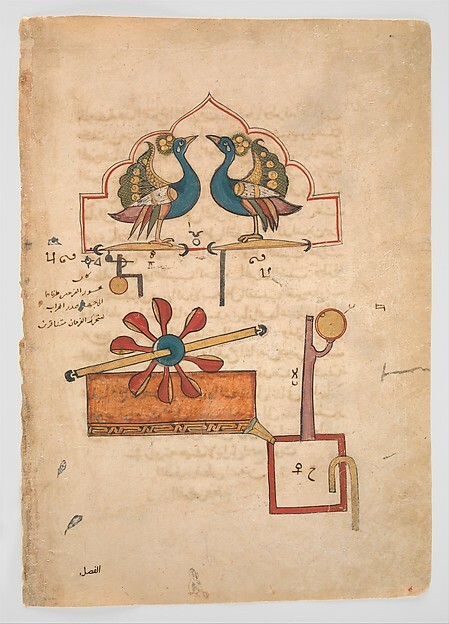 “Design for the Water Clock of the Peacocks”, from the Kitab fi ma’rifat al-hiyal al-handasiyya (Book of the Knowledge of Ingenious Mechanical Devices) by Badi’ al-Zaman b. al Razzaz al-Jazari. MMA 55.121.15. Image: Metropolitan Museum of Art. The exhibition also features gold ingots (metal exchanged for its value) in the shape of horse-hooves of the Western Han dynasty (206 BC–AD 9). These objects show how certain standards change with the reigns of new emperors. Because of an auspicious vision, the Han Emperor Wu (r. 141–87 BC) transformed the shape of gold ingots from the hooves of qilins (mythical creatures) to horses. A bronze mold for half-ounce coins (banliang) from the Qin or early Han dynasty, ten bronze half-ounce Qin banliangs, and five Han dynasty imitations of Ancient Persian (Parthian) coins are other examples. Three hoof-shaped ingots excavated from the tomb of Marquis Haihun in Nanchang, Jiangxi, 2015. Image: Metropolitan Museum of Art. Instead of directly showing coins, some of the most iconographically complex objects in the exhibition imply the importance of a monetary economy. The lids of two bronze cowry containers are comprised of sculpted figures, one even displaying a sacrifice scene. Cowry container with scene of sacrifice excavated from Tomb no. 69 at Lijiashan, Jiangchuan, Yunnan, 1992, lent by Lijiashan Museum of Bronzes. Image: Metropolitan Museum of Art. According to the exhibition curators, cowry containers such as these could have been adapted from bronze drums. In ancient times, cowry shells were utilized as currency, particularly in coastal regions, before copper became more accessible. The American Numismatic Society’s collection features cowry that are attributed to China, Africa, and India, and perhaps these would be the kind of objects that would fill these sumptuous containers. Bone cowry, China, 500–221 BC. ANS 1937.179.4191. 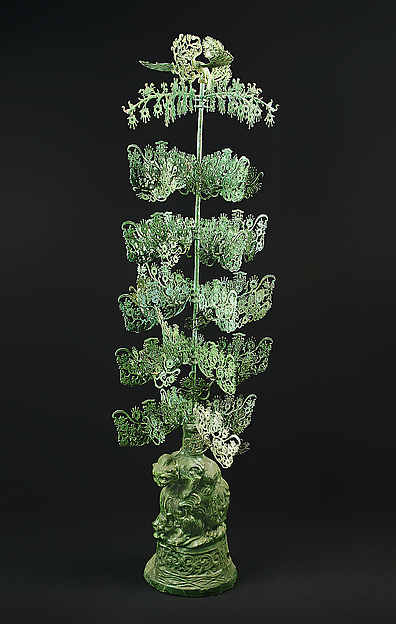 One of the most elegant objects in the show is known as a “money tree” (qian shu) or “money-shaking tree” (yao qian shu). The exhibition label reports that approximately 200 of these are known and they were functioned as funerary goods. 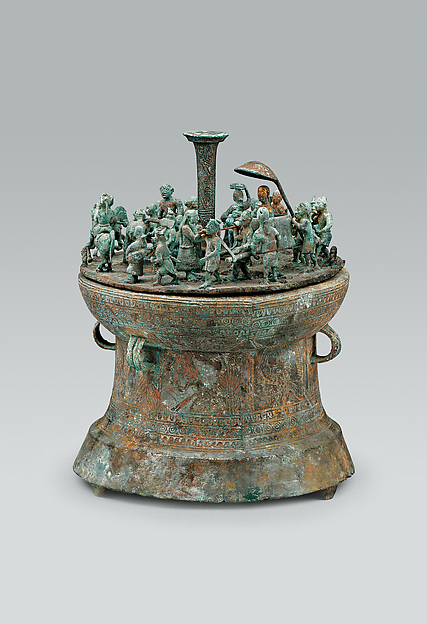 The example in the exhibition made of bronze is attributed to the Eastern Han Dynasty (AD 25–200). From afar, the six layers of branches of the tree look highly ornamented, yet coming close one notices that the leaves of the tree are formed of bronze square-hole coins. How were these money trees produced? Did the same artisans responsible for minting money cast them? “Money tree” excavated from Shixiangcun, Wanfuxiang, Guanghan city, Sichuan, 1983, lent by Guanghan Municipal Institute of Cultural Relics. Image: Metropolitan Museum of Art. While numismatic evidence may pose many difficulties in museum exhibitions—their scale, legibility, and overall impact on a viewer—being a few, Age of Empires demonstrates how coins were inherent to the process of imperial standardization. Highly ornamented and much larger scale objects potentially imply the power of numismatics.